How We Went Plastic Free (And You Can Too)! 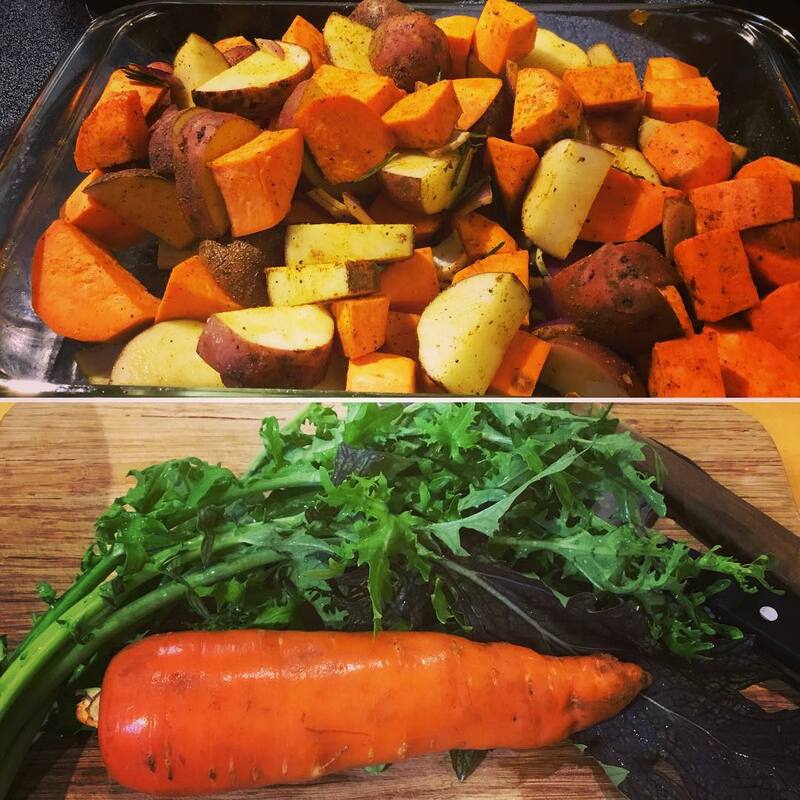 Home Blog How We Went Plastic Free (And You Can Too)! We said NO to Plastic for a whole month! Here’s how! No new plastic waste would be generated [single use or reusable], but we would use up any plastic products that we already had in the house before April 1. Now we’re not gonna lie: we were tempted to load up on supplies for March 30, but we resisted. Barely. We had already been making our own toothpaste for over a year (see recipe below), but dental floss was another matter as conventional floss is made from nylon thread. 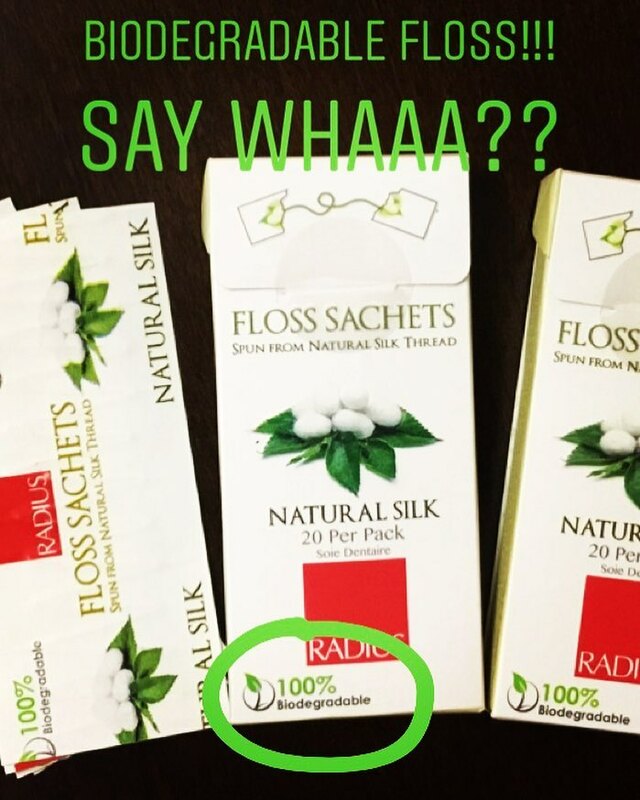 In looking into a plastic-free alternative, we discovered two options (a vegan floss and a silk-based floss, both from a company called Radius), but they didn’t make the cut because they came in a plastic dispenser – and the vegan option was still nylon! However, we discovered that Radius also offered its silk floss in pre-measured lengths that came in biodegradable packaging. 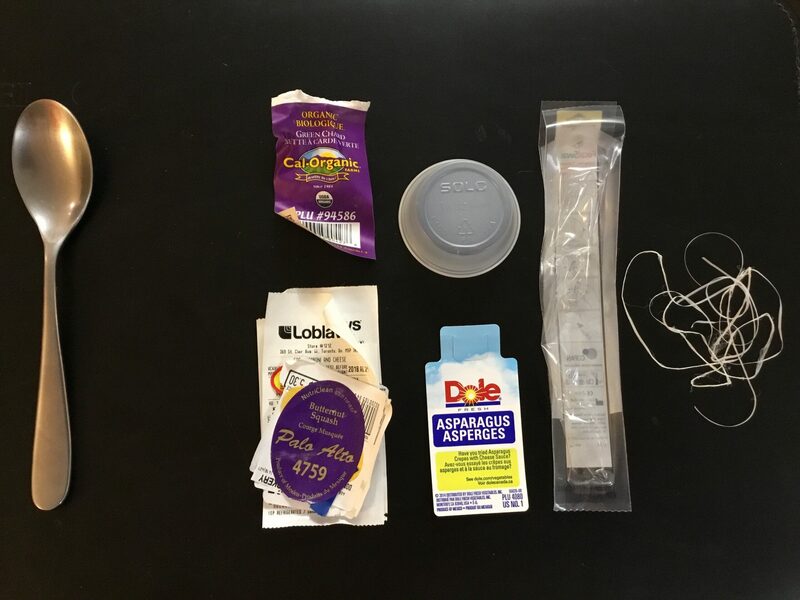 It was pretty expensive but we were willing to give it a try, and it’s really great how we can just throw the floss and packaging into our backyard compost bin! We continued to use our regular toothbrushes as they were brand new, but we will likely switch to bamboo toothbrushes as soon as they are done. We consider ourselves to be pretty environmentally conscious (we typically only generate a small bag of garbage a month on an ongoing basis; most of our waste consists of recyclable items or organics which we compost in our backyard for our garden), but wow did this month ever reveal how much plastic waste we still generated…and that almost all of our garbage was comprised of plastic! Despite a concerted effort to stop plastic from coming into our eco-conscious home during our plastic-free month, we were confronted with how much plastic was already there. April (not quite zero but close!). The tablespoon is there for scale. Shopping at Costco (and other big box stores) was NOT as environmentally beneficial as we’d led ourselves to believe. We’d thought that buying food stocks and household items (oatmeal, lentils, chips/snacks, frozen berries, protein powder/bars, salad greens, laundry detergent, etc.) in super-sized quantities was better than smaller-sized containers because (1) the unit cost decreases with larger sizes, and (2) it’s less packaging per unit (more plastic is required for 10 x 100 mL single servings of yogurt than for one 1 L tub). But the reality is that this still amounts to a LOT of plastic waste. We were surprised at how much plastic there still was at the end of the month, despite all our efforts. At restaurants, even when we asked for no plastic, there was the occasional time when we still received our sauces or dips in plastic (see picture above), but at least we managed to avoid getting any plastic straws! The food and grocery industry accounts for a staggering amount of waste. Together, food and packaging/containers account for almost 45% of the materials landfilled in the United States alone! Containers and packaging alone contribute over 23% of the material reaching landfills in the U.S., and some of these discarded materials are food-related containers and packaging (source: United States Environmental Protection Agency). The UK produces more than 170 million tonnes of waste every year, much of it food packaging. In Canada, we are not much better. In all of Canada, only 11% of our plastic waste gets recycled. In Toronto alone, 25% of all materials placed in blue boxes weren’t recyclable in 2017 due to contamination – did you know you have to clean your peanut butter jars, yogourt tubs, etc. before tossing them in the blue bin? Many people don’t know or don’t bother and unfortunately, this is why most of our recycling doesn’t get recycled. Contamination has recently become a much bigger issue because China, the world’s biggest importer of recyclable material, started banning imports of plastic and paper with more than 0.5 per cent contamination — a standard that North American cities are struggling to meet. And this is just the U.S., the U.K. and Canada alone; imagine the amount of plastic waste generated by the rest of the world! And because plastic never actually breaks down, it ultimately ends up in our oceans and on our beaches, ingested by sea animals, fish and birds…most likely reaching your plate or drinking water, resulting in an entire host of health issues. 3) Increased creativity and nutritional intake! 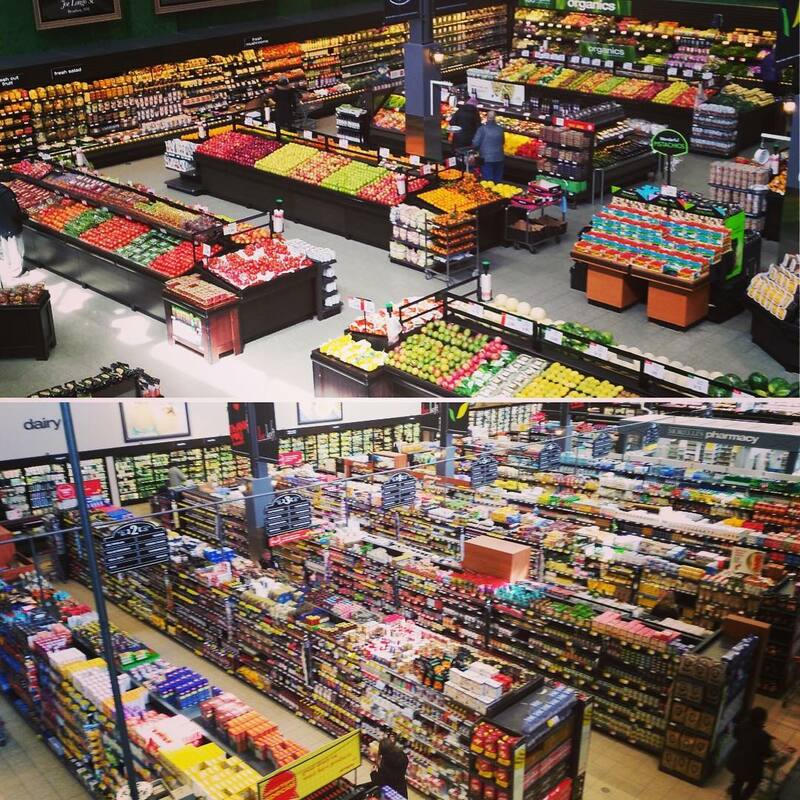 We were able to experiment with a variety of fresh produce and buy local and in-season. Although admittedly not 100% vegan on a regular basis (we still eat honey and free range eggs from chickens lovingly raised by people we know), we ended up going almost entirely vegan for the month and avoiding junk food because it all came in plastic! 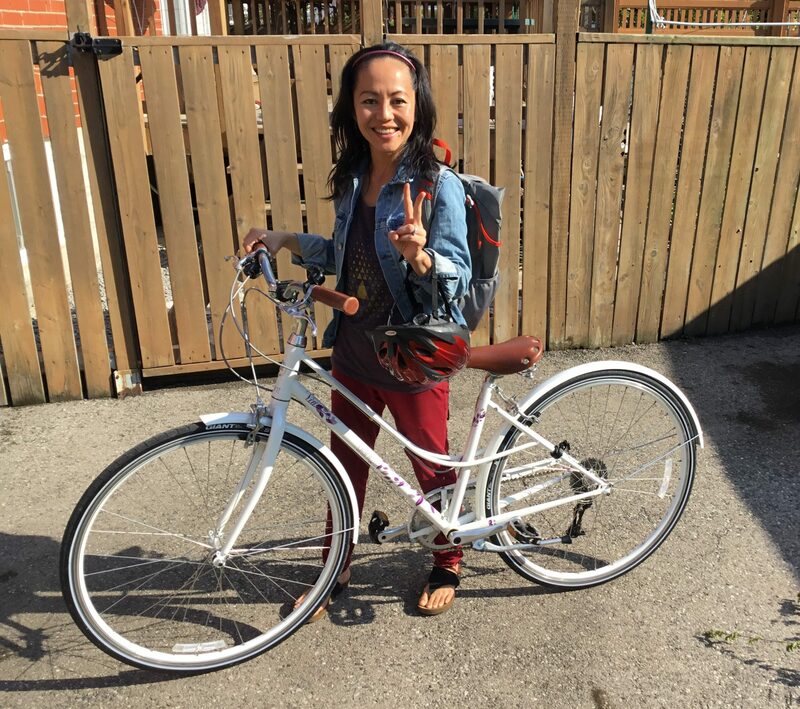 And the added benefit was the reduced carbon footprint and all the fresh air, sunshine and exercise that resulted from getting on a bicycle rather than hopping in the car to drive the oftentimes long distances to the nearest grocery store or Costco. As well, we would buy our dry goods like nuts, seeds, grains, spices, etc. at our local bulk food store. It was simple enough for us to bring our own containers, get them weighed and fill up with whatever we needed. Again, ZERO plastic = ZERO waste! It was easy enough for us to bring our reusable sporks, drinking straws and rice husk cups with us wherever we went to avoid single use disposable plastic, but there was the occasional time where we felt like the odds were stacked against us, such as trying to get restaurant meal leftovers to go in non-plastic reusable containers – in many cases, this just simply wasn’t possible! And because we’re pretty extreme people, “No plastic means absolutely NO PLASTIC”! 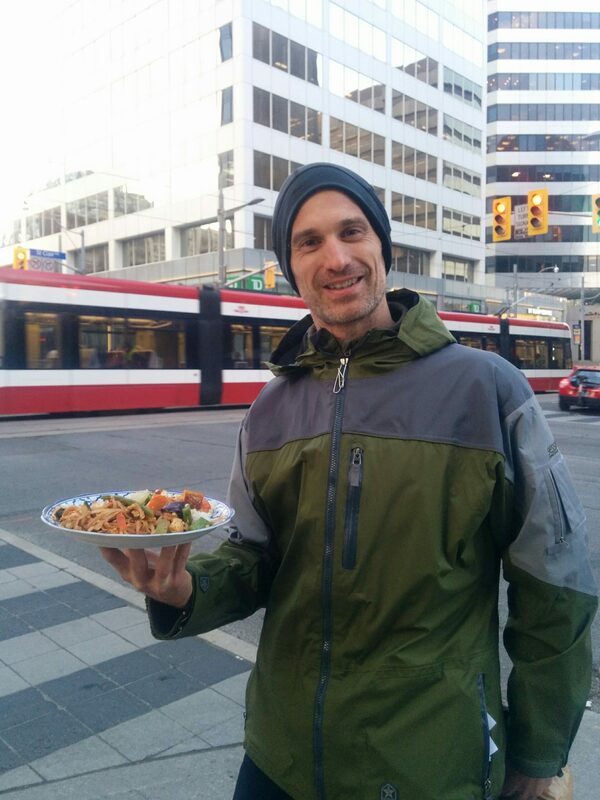 In one situation where we forgot to bring our own containers to our favourite Thai restaurant, and rather than getting our takeout in styrofoam, Wes had to put a $20 deposit down for a ceramic plate, which he used to walk his order over to his office where he had reusable glass containers (we did say we were extreme!!). To be perfectly honest, we do miss our occasional junk food indulgence. However, after this month of being very conscious of plastic waste/packaging, we will never be able to look at individually wrapped items (candy, chocolate bars, etc.) the same way again. We simply can’t justify our few minutes of enjoying a bag of chips to come at the environmental cost of that bag of plastic. So instead, we’ve decided to make (organic, non-GMO) popcorn at home and season it (Stef likes coconut oil/sea salt, while Wes likes to experiment with jerk seasoning, Indian spices, nutritional yeast, etc.) – and there are plenty of snacks available at the bulk food store. For the most part, we are committed to adopting this plastic-free, pretty much zero waste lifestyle. There are currently three things that come in (or are made of) plastic that we’ve had a hard time replacing with suitable plastic-free alternatives: dental floss, synthetic cycling and yoga clothing, and Dr. Brommer’s liquid soap. To be honest, the silk floss shredded almost every single time we tried to use it, and have you ever tried to go to sleep with a piece of dental floss wedged in your teeth??? Worst. Feeling. Ever. The only floss that currently works for us unfortunately for now is the regular shred-proof nylon floss (which Wes’s teeth somehow still manage to shred on occasion). However, we are always looking for plastic-free alternatives, so if anyone has any suggestions for your favourite plastic-free floss, please post them in the comments below! Another thing we both have a hard time replacing is synthetic fibres/clothing – fast fashion is everywhere! Wes rides his bike almost everywhere most days throughout the year and has been using his synthetic biking gear for years. Stef teaches yoga, and pretty much everything designed for yoga and movement has lycra or spandex in it, even the organic cotton stuff! But since we’ve found out about how synthetic clothes shed microfibres when washed, we just don’t ever wash them anymore…kidding! But we are aware of their environmental impacts and will therefore likely not buy any more once they reach their end of life. And we have been investigating some very innovative solutions that have recently come out to help capture microfibres in the washing machine before they go down the drain and enter our waterways. Two that we have found are: the Cora Ball and Patagonia’s Guppy Friend. Last but not least: Dr. Brommer’s pure castile soap. We’ve been using this for years to clean our house, wash our hands, even to make laundry detergent. We have heard that some places offer free bottle refills on natural soap, so we’re eager try anything to reduce our plastic bottle consumption! A handy tip: if you want to really stretch your dollar, buy a foaming soap dispenser (preferably non-plastic). To refill it, put in 3-4 tablespoons of liquid soap and then add water to ¾ full. One bottle of liquid soap will last you months, if not years, this way. It’s cheaper and creates way less waste. Everything else is really just a matter of changing habits. In no way do we feel like we’re compromising our quality of life by turning down plastic. In fact, we’re compromising much, much more (globally) by continuing our wasteful lifestyle of disposable single use plastic consumption! We truly feel that the biggest changes happen from the ground up and, rather than waiting for government or industry to provide solutions for us (which may be a long time in coming), we’ve chosen to take matters into our own hands. If we as consumers empower ourselves by starting to make these changes on a day-to-day basis, reducing the amount of single use plastic we generate wherever and however we can simply by choosing reusables instead, then industry will certainly respond in kind by providing us with better, more sustainable options! Market economics 101: demand influences supply! And this is how together we can make a shift for the better. A healthier, happier planet results in healthier, happier people…and it starts with you and me. 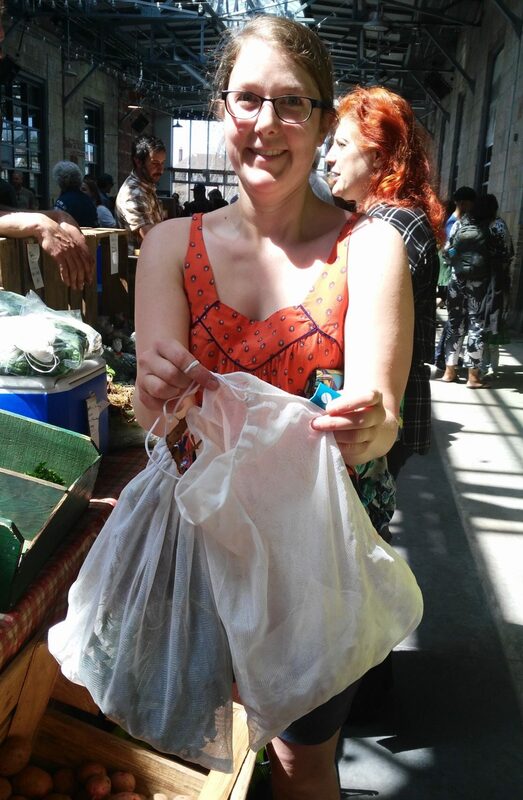 Advice for Anyone Looking to Go Plastic-Free – It’s really not that hard! 1. Set yourself up for success: find out where there’s a bulk food store near you, collect some reusable containers (optimally glass jars, but totally up to you), and consider making some of your own alternatives. Get yourself some reusable items (food containers, travel mug, cutlery, and drinking straw if you use one) so you can have litterless lunches, even when you go out to eat. 2. Commit to a month: it’ll take at least that long for your new behaviours to become habit. We’d love to hear from you! What small (or big) changes are you willing to make, or have already made for the planet? 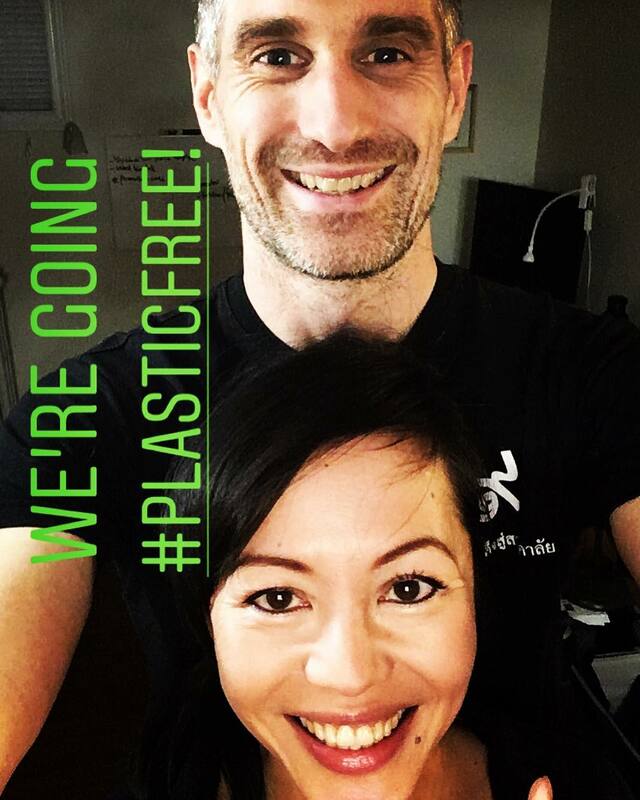 Wesley Wright & Stefani Chan-Wright are the founders of Ahimsa Eco Solutions (Ahimsa Eco), which was initially created with the purpose of providing solutions for a plastic-free planet, and has since evolved into a business for good. Ahimsa Eco gives ten percent of all its sales to causes and organizations which are doing amazing things environmentally and socially for the planet.